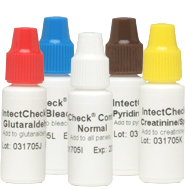 IntectCheck® is designed to validate the performance of Intect®7 Urine Adulteration Test Strips. IntectCheck® contains normal and abnormal amounts of each analyte and provide the distinctive color result for the respective negative and positive reaction on Intect®7. Specifically, IntectCheck® is a series of 5 standards to provide an assessment on the performance of the Intect7.